Security trust is now expected to run out of money in 2035, three years earlier than projected.” How’s that for accurate reporting? Hmmm. The Daily News says the trust fund will run dry in 2033. The Tribune says Social Security is slipping closer to insolvency. The Christian Science Monitor says “fund cash” will be gone in 2033. I fail to see anything wrong with any of these explanations. I won’t defend Scarlet Fu’s idiotic “train wreck” comment, but the rest of them strike me as OK. I said last week that liberals should get off their fainting couches and stop complaining every time someone reports that Social Security funding is in trouble. Unsurprisingly, not many liberals agreed with me — and I’m willing to give some ground on my defense of the “bankruptcy” formulation, which is probably suitable only for polemics. Still, the trust fund is running out of money. 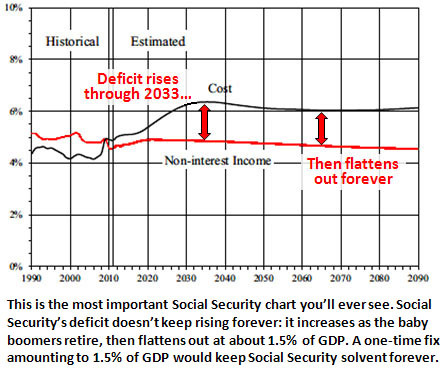 Social Security is heading toward insolvency. What else would you call a program that can only pay out 75% of its promised benefits? The place where the media falls down, I think, isn’t in its description of Social Security’s financial problems. The media’s real weakness lies in its almost total lack of interest in explaining how those problems can be fixed. The answer is: pretty easily. The only thing stopping a simple, no-drama resolution of Social Security’s long-term funding problems is the Republican Party’s jihad against taxes. That’s it. You could pretty easily put together a Democratic coalition that would support a combination of small, phased-in benefit cuts and small, phased-in tax increases that would fix Social Security forever. If you think Social Security is already too stingy, you might not like the idea of doing this. But it’s still a fact that you could get plenty of Democrats to sign up for such a plan, and President Obama has sent plenty of signals that he’d favor it too. The only thing stopping it is that Republicans simply aren’t willing to back such a compromise. Their only solutions are either unfunded privatization schemes, which everyone knows will never happen, or balancing Social Security’s books solely by slashing benefits, which is equally unlikely. The truth is that, financially, Social Security isn’t a hard problem to solve. It’s only hard because the modern Republican Party, which is happy to scaremonger the problem relentlessly, flatly refuses to engage with real-world solutions. That’s what the media needs to report more often.